I’m super excited to share these holiday gift ideas! I know that this time of year can be overwhelming and of course you want to make everything perfect for everyone you care about. Between the decorating, card creating, party planning, cookie baking and elf moving we all try our best to find just the right present for each and every person on our list. I tried to make gift gifting a little easier for you with this list. I have to start right here with the Snaptouch because I can’t think of anyone who would not want and could not use and have so much fun with this amazing camera! You have to check out this video to see it in action right now! This new Instant Print Digital Camera makes it so much more exciting to snap, print and share! I love the built in printer that allows you to share on the spot with high quality, full color photos with adhesive backing. It’s really awesome that you do not need to buy any ink or toner cartridges. You can print pictures right away or save them for later and you can even capture moments in high definition video. I also love that you can customize your photos with digital stickers, borders and special filters. Bluetooth technology allows you to use even more exciting editing features when you connect to the Polaroid Print App! The Snaptouch has a selfie mirror, pop-up flash/power button, lens with magnetic cap, microphone, speaker, micro USB port, tripod connector and microSD card slot. And guess what? All you have to do is follow me and @meetpolaroid on Instagram and tag a couple friends on this Official Polaroid Snaptouch post for a chance to win your own on Christmas! Check out my instastories daily for more information! Good Luck! I definitely think ANYONE on your list would GREATLY appreciate the Snaptouch! The rest of this “Perfect Holiday Gift” list is a very diverse group of ideas because let’s face it, every one is different and deserves something picked out especially for them. They are not in any particular order and I’m not even going to break this list down and say “Gifts For Mom” or “Perfect for Him” because let’s face it, I don’t know your mom or your guy. What these choices have in common is that, like the Polaroid Snap Touch, they are high quality, fun and also practical. I hope you find something for everyone on your nice list and something super special for yourself! Let someone enjoy the benefits of a spa treatment with 6 beautifully scented and packaged 4 oz. bath bombs. They are 90% larger than similarly priced bath bombs (usually 2-2.5 oz) and are made from dried flowers and only natural ingredients. This collection from Anjou includes bombs made from essential oils such as lavender, peppermint, sweet orange, lemon, rose or citronella which are chosen for either reinvigoration, renewal or relaxation. These velvety and dense brushes come with non-toxic and odorless synthetic hair that won’t shed. The set has not been tested on animals and the fiber bristles are 100% vegan and cruelty free. They are super soft and deliver just the right amount of product thanks to their denseness. This Anjou makeup brush set is as diverse as the looks you want to create. It has 4 large and 4 small brushes for foundation, concealer, contour, blush, highlighter, eyebrows, eyeshadow and lipstick. I love the all black waterproof case which keeps everything neat, chic and protected when traveling. Anyone that wants impeccably straight and wants it quickly would love this wider ( 1.65 Inch) heating plate that straightens more hair at once so you can achieve a silky, straight look in less time; gently yet firmly clasps even on thick hair. It has a fast PTC heating core; heats from 250 degrees to 450 degrees and keeps the set temperature. It’s tourmaline ceramic- coated 3D floating panel allows for uniform heat distribution and results. This Anjou set includes a heat resistant silicone pad for safer laying down and a thermally insulated protective glove. “Life is art. Live yours in color.” That’s the motto of Stefano Lungo Watches and I’m in love! This is the type of gift you have to get for yourself as well as everyone on your list! And the best part is - YOU choose the 3 colors you would like in an either rose gold or silver setting. There are 8 different colors to choose from once you decide between the rose gold and silver so you actually get to custom make this set to be perfect for your loved one or yourself! The possibilities are endless! Be sure to follow @stefanolungo on Instagram and be inspired by the combinations and styles! My kindergarten class and my own children (2nd & 6th grade) really loved this book by Stacey McAnulty! The message of Brave is clear and entertaining. It helps children (and even adults ) see that all of us are heroes when we face everyday challenges and new experiences with courage and pride. I definitely recommend it and think it would be a memorable and very much loved holiday gift for any child. I’ve been a fan of lipsense for quite a while now because it really does work. It stays put on my lips all day - totally kiss-proof ;) and it comes in an amazing variety of beautiful colors. It would be great to introduce someone to the brand or surprise them with a new shade and include a gloss and remover of course in a kit like this from Life With Lip Gloss. Use my code: JENNIFER10 for 10% off! The fabulous thing about this dryer is that it has the power of a full size dryer but fits in the palm of your hand. It’s high compression turbine fan and multiple heat settings make it perfect for anyone’s travel drying and styling needs. It’s so compact it would be awesome hidden in a stocking along with little hair accessories or mini shampoo and conditioner. Send someone the world’s softest dream-inspired comfort with these cozy pajama sets that come in personalized bags and in a huge variety of styles and patterns. Pajamagrams has great options for men, women and children and you can even find matching sets for the entire family! 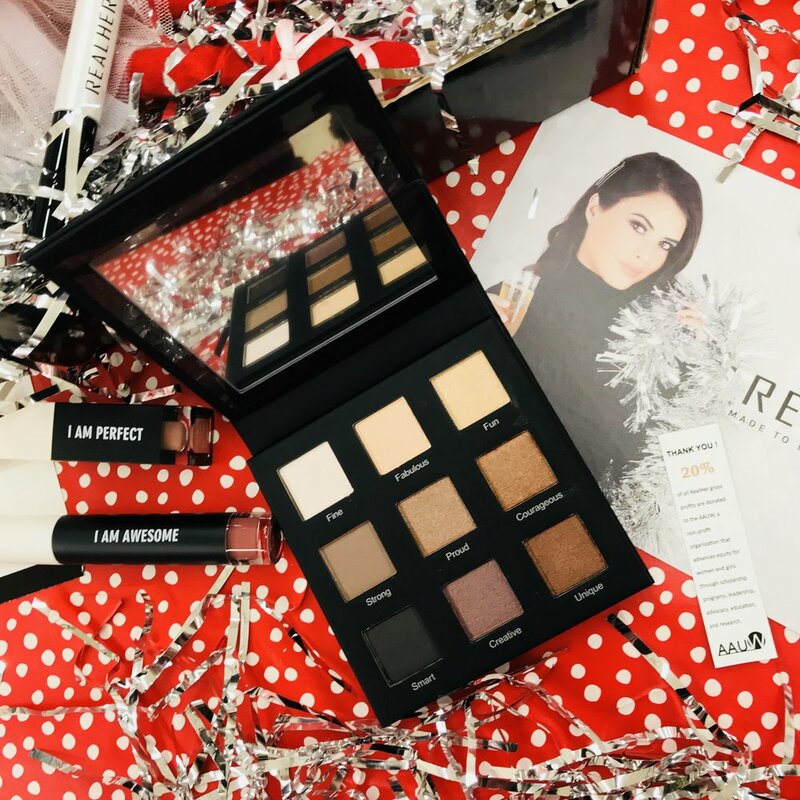 RealHer makeup is unique because of its mission and innovative products. They are a new era of cosmetics created with a mission to inspire and empower all. RealHer donates a percentage of its proceeds to organizations that support women. They pride themselves on creating innovative products and being cruelty free. Find their entire collection here. For those of you they may be following my instastories you may have noticed that I have been sharing many different styles of shoes from Andrew Stevens. This pair is called the Cheyenne Black Heel Sandal and made out of the most luxurious imported leather. They are extremely comfortable and so versatile and easy to wear with leggings, skirts, dresses and pretty much everything! I love the fact that they have the open toe so they are awesome for all year wear. They come in a gorgeous brown shade too and you can check out the entire collection of Andrew Stevens Collection Footwear here. Be sure to use my code: JENNIFERQ25 to save 25% off! Those of you that have been following me for a while on Instagram know that I am a huge fan of Freshly because of the way they obsess over sourcing the highest quality ingredients so they can craft all natural nutrient rich meals and deliver them right to my doorstop! My husband and I loved having freshly meals at our door all summer as I showed you here on this Instagram Carousel Post. My whole family appreciates having such delicious and healthy meals during the busy beginning of the school year as I showed you here and of course we REALLY love the many different varieties they offer. We just recently tried some of their newest meals and thought about what a great gift Freshly would be for so many people! Who wouldn’t want six healthy and extremely delicious dinners? Use this code: dlvr639 for $20.00 off! It’s really wonderful to be able to give beautiful presents that are both luxurious and affordable and that you know will be appreciated like a gorgeous pair of velvet booties from the Jadams Collection at Zooshoo or this Double Strand Pearl Necklace and Bracelet Set from Pearl Rack. This exclusive gift set features the doll design from Kusmi Tea’s 150th Anniversary to finish out the year with a bang. It is the perfect gift for tea lovers who are looking for a tea pairing that will inspire sharing and discovery. In this Wellness Doll Set there are two of the brand’s must have blends made with mate, green tea and flavored botanicals. It includes a 4.4 oz box of the exotic Blue Detox with Pineapple Blend and a Miniature .88 oz BB Detox with soft grapefruit notes. I love the engraved silver plated spoon this elegant set comes with so the tea can be perfectly measured out. Have you seen the difference in Aerosoles lately? Not only do they have the amazing Aerosoles technology so that you can be comfortable all day and evening, they are absolutely gorgeous! Check out the entire collection here and definitely choose a couple of pairs for yourself and your favorite ladies so you will all not only look fabulous but feel energized and ready to take on any party with festive flair! I was amazed to read this article about mascara and happily surprised to see that one of my very favorite brands and mascaras was chosen as a top pick. It’s the Definitials Mascara and comes in this amazing kit called the Ombré Hypno Stylo Stick & Definitials Bundle. It would be really great to gift someone with an award winning product and the 3 BRAND NEW metallic eyeshadow sticks that come in this kit. The shades are Bleu Chrome, Amethyst and Rubis and the design is so unique that they can even double as waterproof eyeliners. I also think the Lancôme Holiday L’Asolu Rogue & Juicy Tubes Bundle is a great gift option and also a must have for yourself especially for all holiday parties and festivities you may be attending. It includes gorgeous shades of hydrating lipstick and ultra shiny lipgloss. See all details here. This is something I had never seen before and had to try. After using it for a month I definitely think it would be an appreciated present. This set is the easiest way to highlight, ulluminate and enhance your face and accentuate your best features. It’s unique creme-fluid texture provides the softness of a powder for a barely there shimmer and builds coverage to the brilliant result you expect from a liquid highlighter. This kit comes with a warm gold shade, a rose gold shade and a bronze shade and you can find it here. 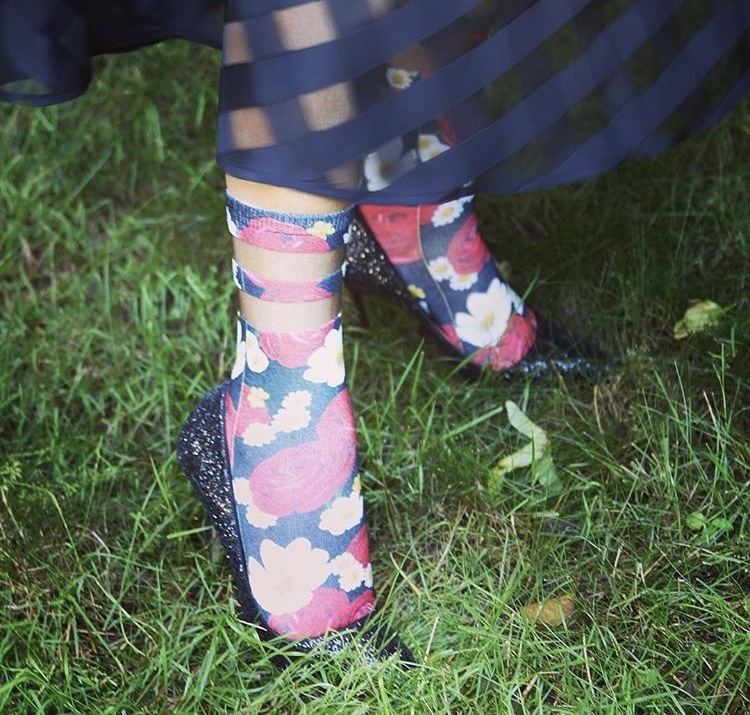 I had to include these fabulous Color-In Socks from the one and only Living Royal! Such an awesome collaboration between two of my favorite brands and I definitely think they speak for themselves! There are lots of cool color-in patterns to choose from so go ahead and check them out here Use code: MOMMYTEACHERFASHIONISTA to save 20%! Who on your list would absolutely love them? Of course they don’t just have socks to color! This is one of my favorite pairs of Living Royal Socks! They have so many different fun patterns and prints to choose from, even Christmas Scented Socks that smell like chocolate, vanilla and peppermint! ABC See, Hear, Do: Learn to Read 55 Words teaches letter sounds and early reading skills. It’s a super fun and engaging book that uses visual, auditory and kinesthetic learning styled to teach children to read! It really works because they see the letter, hear the sound and do a hand motion which, making sounds easier to remember. After learning only four letter sounds, children will start to blend the sounds together to form words. ABC See, Hear, Do 2: Blended Beginning Sounds is the second book in Hohl’s series. Once your child knows the individual letter sounds, it’s time to start learning letter combinations that blend together and again visual, auditory, and kinesthetic methods are used to help children learn the sounds effectively. In combination with the sounds learned from the first book, children can start to read four-letter words. The ABC See, Hear, Do Coloring Book is a great supplement to the series and I think the set of three books would be a perfect, educational and engaging present for a young child. Such a wonderful way to fill a child’s stocking and give them the gift of literacy! You can win this set by following author Stephanie Hohl on Instagram and commenting and tagging a friend on my instagram post here featuring these amazing learning books! Happy holiday shopping, good luck on winning the many giveaways I have going on on my instastories and thank you so much for visiting the blog today! I hope you enjoyed this list of what I think are really fabulous gifts for a wide variety of people. I hope you discovered some new ideas and definitely hope you found something special for yourself! I’d love to hear about your favorite holiday gift ideas and connect further so feel free to leave me a comment, email or even a link if you have one to share. I will definitely get back to you in a timely fashion. I truly appreciate your time and attention and hope you all have a beautiful holiday season. Enjoy every moment of your family and friends! ps. In case you needed just one more idea (or 2) I’ll let you know what I’m hoping will be in my stocking. This fragrance is from the warm and spicy family and an olfactory creation of Alexandra Monet. It has key notes of orange from Brazil, petite grain from Paraguay and vanilla from Tahiti. It’s deliciously addictive! Clarins Double Serum is the innovative result of 30 years of research and the only anti-aging serum that reactivates the skin’s five vital functions. Both of these products are must- haves for me right now!